Adult scooters are becoming more and more popular over the years for several reasons. They’re incredibly fun to ride around, and they’re a whole lot more comfortable than the ones you probably rode on as a kid. Those ones were bulky, metal clunking machines that hurt every time they spun and hit your ankle. We’ve all been there, but adult scooters don’t seem to have the same issues. On top of that, adult scooters are also an excellent means of inner-city transportation. While you can’t take one of these things on the freeway, you can certainly get your errands done with it. A lot of people also ride them to work, school, and around town to a friend’s house. There’s no battery so you don’t have to worry about breaking down and being stranded. So why would someone choose an adult scooter over a car? Well, in certain scenarios, having an adult scooter is actually much more convenient than a car believe it or not. For starters, if you can’t fit exercise in your day like most of us, then you can always make your commute an exercise by using the scooter. Another great reason to choose an adult scooter over a car is that they’re eco-friendly and don’t put off-gas emissions. All in all, adult scooters are an incredible invention that helps us get more stuff done with a smaller vessel. But with all of the options on the market, how do you know which ones to choose from? 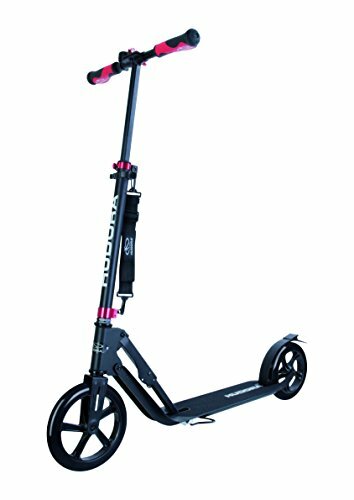 We’ve done all kinds of research through all the blogs and reviews that we could find, and what we noticed was that the Hudora 230 Adult Scooter was commonly mentioned as one of the best around. Instead of making you find out the details yourself, we’ve come up with a full product review to show you what makes this adult scooter a hot pick! Although it’s not always the most exciting thing to talk about, safety features are very important, especially when you’re riding in traffic. You want everyone to know of your presence when weaving in and out of foot traffic and occasionally in the streets, so finding a strong, reliable scooter is key in all situations. The Hudora 230 Adult Scooter is incredibly great at making itself noticeable since it features a signature shine that’s viewable from far away, even while in a car. This scooter is made out of solid aluminum alloy, which is much stronger than a lot of other scooters. Many other brands settle for cheaper materials, which produces a cheaper product. This might sound good until you realize that a cheaper product with low-quality materials means that it’ll rot and rust from rain and other weather damage. Luckily, you won’t have to worry about that with the Hudora 230 scooter. Finally, this scooter comes with an incredible fast-acting rear brake. While it doesn’t have the handlebar braking system like some other adult scooters, a simple press of your toe on the back tire brake will bring you to a quick halt. You don’t have to worry about a heated up wheel either, because the metal protects your foot from the warmth of friction, unlike other scooters’ brake systems. So what’s the deal with the big wheels on this scooter? You might notice that a lot of adult scooters have big tires, and there are’s a few reasons for that. Let it be known that not all scooters come with bigger wheels, so if you come across an adult one with small wheels, stay away from it! They’re necessary in making the ride an all-around better experience. Large wheels are great because they help make the ride much smoother. When your scooter has small tires, even the smallest cracks and bumps will make a huge, uncomfortable, noisy thud that you’ll notice. Riding on a sidewalk is a constantly bumpy situation unless you get larger tires like the ones on the Hudora 230 Adult Scooter. Another reason that these larger tires are great is that they help hold a lot more weight than smaller tires. The maximum weight limit for this adult scooter is 264.5 pounds, which covers most of the adult population in the world. The front wheel is 9 inches, while the back wheel is 8 inches. This tilt provides a more comfortable ride as well and helps reduce the shock and increase suspension when riding on rough surfaces. We briefly touched on how important it is to be eco-friendly, but adult scooters are largely used because of this feature. People love the idea of being out in the open air, whether it’s on the way to run some errands or just for an after a work exercise session. An adult scooter brings back the relaxing fun times in life where you could simply cruise around and decompress after a long day of working at your job. On top of that, putting out zero pollution always feels great! Adult scooters don’t use gas, and non-electric ones obviously don’t use a battery either. This means that you’re using virtually zero energy, gasoline, or any other substance that could possibly pollute the planet in any way. The only thing you’re putting out is CO2, and that’s just from exhaling through the great exercise that you’re getting! With the hundreds of millions of cars polluting the Earth every single day, even just a few people riding an adult scooter can make a real difference. If you agree with us that there should be less smog in the atmosphere and that we all need to protect the world for future generations to come, then riding around on a scooter for even just a couple times a week can make a real difference. + This adult scooter features larger tires, which makes the ride much smoother for you. Don’t worry about all the little bumps and cracks in the roads and sidewalks, as they’ll cause almost zero disruptions whatsoever. + The durability of the Hudora 230 Adult Scooter could never be put into question. They use only the best aluminum alloy to create a nearly weatherproof barrier to prevent rust and other damages. + The weight capacity on this scooter holds up to 264.5 pounds, which is far more than enough for most of the world’s population. Many other brands settle for 180 and sometimes even lower, which is obviously not enough for a great number of people. + The rear brakes on this adult scooter work very well in slowing you down to a stop in a matter of seconds, sometimes less. You also don’t have to worry about the brakes heating up, since the metal protects your foot from the friction warmth. – The fact that there’s no handlebar brake system might be a downside to some users. Many other adult scooters feature a handlebar brake instead, but the Hudora 230 scooter’s rear brake is just as efficient. – While the wheels on this adult scooter are some of the best for riding on sidewalks and streets, they’re not meant for off-road driving. Surfaces like grass, dirt, and sand would give these tires a hard time. The Hudora 230 Adult Scooter is suitable for anyone who’s looking for an eco-friendly alternative to getting around town. Cars pollute the environment which has very clear and devastating effects. Although nobody can use these scooters on the freeway, you can always use them around town to help make your mark, or rather reduce your mark, on our planet’s ever-growing pollution problem. This scooter is also suitable for anyone looking to get some good exercise or someone who wants a more exciting way of getting around. Sitting in a car the whole drive can be very boring, and oftentimes people zone out and don’t pay much attention. If you’re riding from place to place on a scooter, you’re fully immersed in the world around you, and the possibilities of not paying attention to everything is virtually impossible! We like the Hudora 230 Adult Scooter so much because it has all kinds of fun and unique features that not only provide a smooth, relaxing experience, but they also keep the rider safe while in transit. You never have to worry about your scooter rusting out or having a faulty brake system. Everything on this scooter is made with the best of the best materials in the industry, which provides some seriously needed peace of mind! We also like the quick-folding mechanism that works in less than 3 seconds. If you’ve ever tried to fold up one of those classic scooters, then you know the pain of spending what seems like hours just folding it up to put away. Even worse was when they didn’t fold up and slowly rusted to the point where not even the Hulk could close them! In the end, the Hudora 230 Adult Scooter truly impressed us. By the time we were done reading all the reviews, it was no longer a surprise that everyone loved it so much, us included!